We saw a need for premium quality pet products, including nutritious pet treats that were 100% Australian made that were readily available to pet owners nationwide. We also saw a lot of pet owners and pets in need of help, and a want from other pet owners to help those who were in need. From these two factors came a simple idea: Paws for A Purpose. 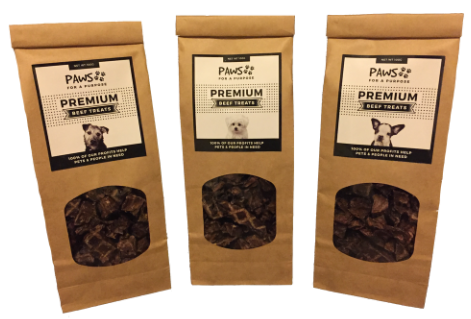 And our first product, our Premium Beef Treats for dogs. ​By selling quality products where 100% of the profits can go to solving some of the pet-related issues across the nation, we can help make the world a better place for pets and their loving owners. Everyone wants their pet to be happy and healthy. And everyone wants to do the best for their pet. The good news is that it's easier now to find a healthy dog treat that is good for your pet and tastes good for them too. Our solution was to bring out a product guaranteed to be 100% Australian and only containing 100% Australia meat. Healthy for dogs and guaranteed not imported, with no added preservatives or colourings, or fillers, or flavours. And guaranteed tasty due to a production technique that locks in flavour and goodness. Paws for A Purpose’s Premium Beef Treats is the ideal training treat, or anytime snack for dogs. High in protein, and without starches or fillers, it tastes great and your dog will love the crunch they get as they munch on this yummy treat. And with an easily re-closeable packet they will stay fresh until the last treat is eaten. Available online or from any leading veterinary clinics, pet stores, dog groomers, kennels, and dog cafes across Australia. And if your local establishment isn't yet stocking our Premium Beef Treats, please let them know that you would buy from them when they do and they need to ask their wholesaler to send them this product. Or for a list of retailers near you who stock our products, please contact us. Order your treats online now!